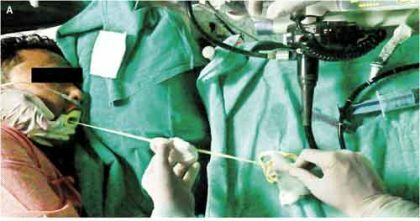 New Delhi: Doctors at Delhi’s Institute of Liver and Biliary Sciences removed a 6.16 ft long tapeworm from the intestine of a 48-year-old patient. The case has been published in the recent edition of the New England Journal of Medicine on January 25, 2017. The patient had come to the hospital with a history of abdominal confort and lethargy. Investigations revealed that the patient was suffering from mild anaemia with an HB of 9.2. 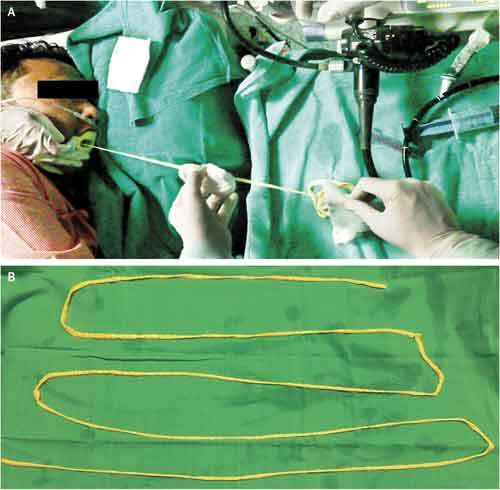 Doctors performed a colonoscopy which revelead a proglottid from a tapeworm in the rectosigmoid colon, and gastroduodenoscopy identified its location in the proximal duodenum, extending distally. The doctors then using a gastroscope as well as forceps extracted the entire tapeworm from the patient’s mouth. To the surprise of the doctors the tapeworm measured around 188 cm or 6.16 ft. The patient was then put on medical treatment with a dose of praziquantel being administered.